This story begins at a large rock, located at a quiet junction on a road that’s so off the grid it doesn’t even appear on Google maps. Te Awa junction – fondly known as “The Rock” – is deep in the heart of the Kaingaroa Forest, somewhere southeast of Rotorua. This spot, surrounded by trees (obviously), is a well- known location for those who work within the region’s foresty industry and it serves well as the ideal meeting place for us to catch up with JJ Caul eld (alias the Dog Handler) and the Mack Titan 6×4 off-highway logger he drives. The eerie morning silence is soon punctured by the sound of a big MP10 engine-braking and through the forest gloom we spot the towering orange Titan Timber Mack…and (eventually) its iconic gold bulldog proudly sitting up high on the square bonnet. This is immediately followed by two Mills-Tui trailers carrying a mighty load of logs – five packets of ‘em, with an all-up weight of around 140 tonnes (giving it a payload of 100t or so). 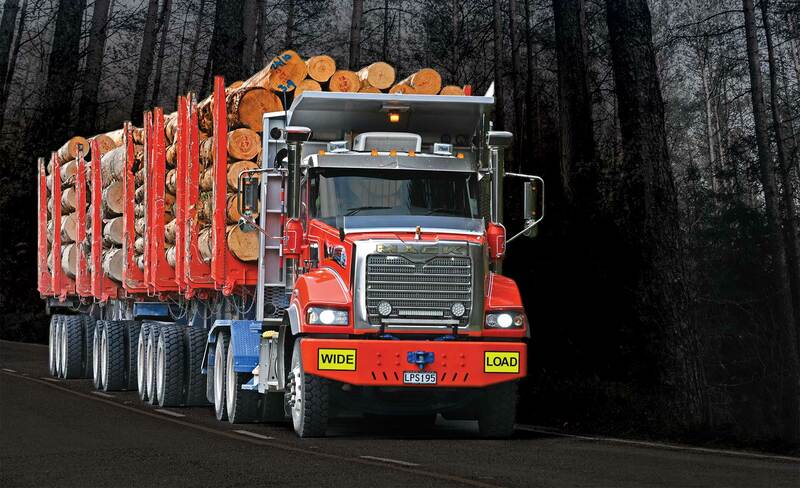 A big Titan, loaded-up like this, is an impressive sight by any standards – and one that’s not often seen in New Zealand. As hard to nd as the junction we’re at, you might say. There’s no disputing the fact that – both for the people involved and the machinery they employ – forestry is a tough industry. And as we’re going to nd out today, they don’t come much tougher than JJ and his big Mack. 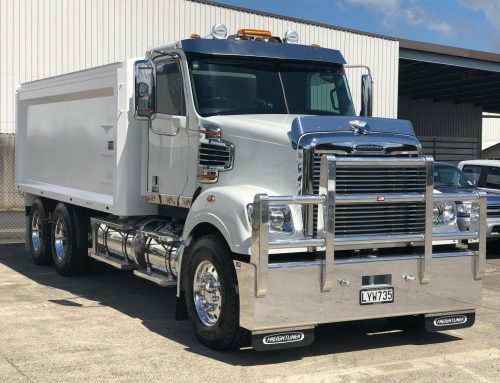 Custombuilt for Titan Timber Company owner Gibbo Dhanjee, the Titan is perfectly suited to extreme duty – heavy loads and challenging conditions. So, in short… ideal for the severe demands of a Kaingaroa Forest off-highway logger. 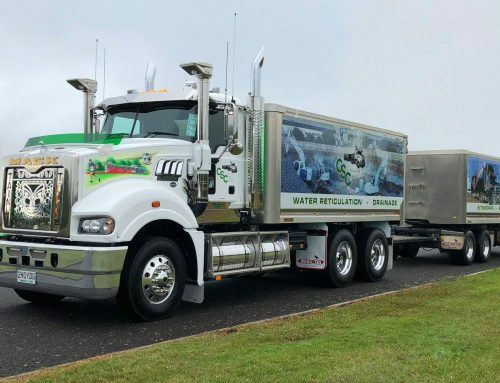 Its 600 horsepower/447kilowatts Mack MP10 heart produces 2065 lb ft/2800 Newton-metres of torque – driven through an Eaton Roadranger RTLO-22918B 18-speed manual box (which is offered as an alternative to the Mack mDrive automated manual on the 600hp MP10, but not on the optional 685hp/510kW, 2300 lb ft/3118Nm rated model). 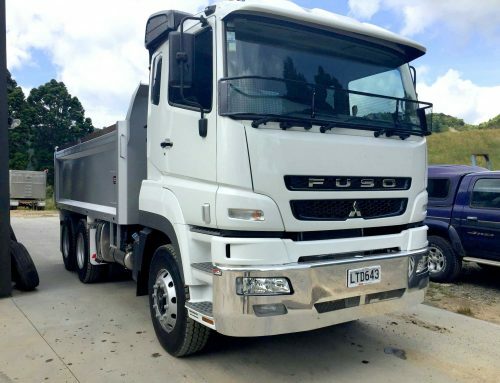 The Titan Timber truck boasts an eyewatering GCM of 140,000kg. When it’s out of warranty, that’ll be upped to 160t. 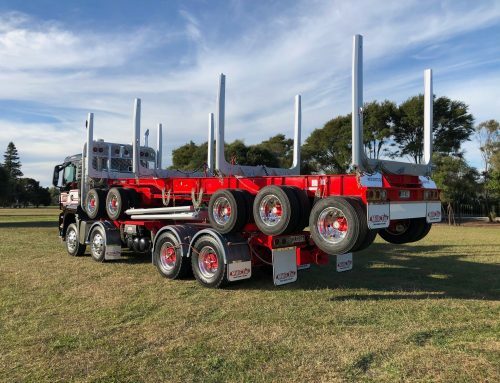 Adding to the impressiveness is the piggyback/foldup arrangement for the first of the two tri-axle Mills-Tui off- highway trailers, linked by a two-axle dollie. 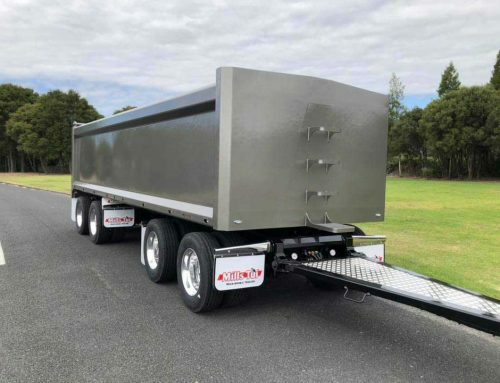 The trailers are built to a 150t GCM rating and the combo stretches out to around 40 metres fully-extended.